The Epiphany, which Russian Orthodox Church celebrates on the 19th of January, marks the baptism of Jesus Christ in the Jordan River. Interestingly, in the West, the Epiphany mostly commemorates the visit of the Magi to the baby Jesus. 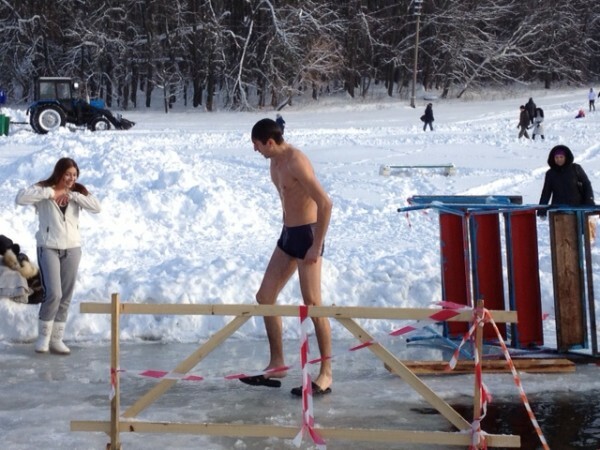 The Epiphany is widely celebrated in Russia. On this day, the Church conducts the Water Blessing rites (also known as the Great Blessing of the Waters). The water is blessed in vats and huge tanks at church yards. Also, the priests go out to the lakes and rivers to bless the waters there for people to plunge in the Holy waters. Nevertheless, today, as in old Russia, a hole is cut in ice, usually in the form of a cross. A priest, followed by a solemn procession, blesses the water and believers take three dips in the Holy and freezing water. These rituals are centrally organized – a list of swimming sites is published, cabins for changing clothes are provided, police and doctors are on site. The tradition was popular prior to the Soviet times and recently came back. One should approach it with proper attitude, with thoughts and prayers about life, friends and the loved ones and try and use it as an opportunity to wash off everything you might have done wrong over the year. But I suppose some people just jump in the cold water for the sake of sport, although I hope they take a pause to think about the purpose of it. 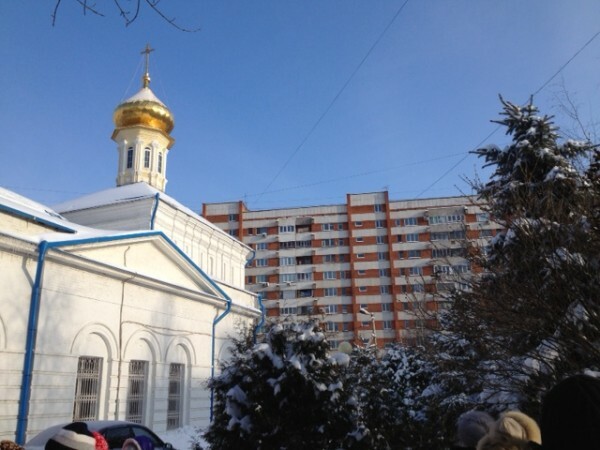 The majority of believers, however, go to churches on the eve and the actual day of the Epiphany to participate in church service and to get blessed water. The water is then kept for the whole year and is given to those who are ill and used to bless the home. 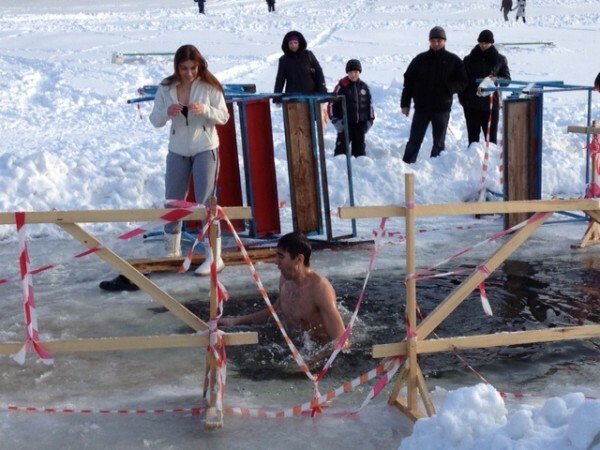 Epiphany is a great holiday and swimming in freezing water – although I wouldn’t call it really swimming but rather quick dipping – should not be considered as a mere oddity. Interestingly, it has a positive, very optimistic tone to it. Probably, because it is connected with new beginnings. Probably, because it is good to see a positively charged unity of people. Probably, because you see a cultural continuum. This year the Epiphany was preceded by two days of snowfall. It was beautiful but gloomy, as always when snow falls in great quantities. Then, the snow stopped and in the early afternoon of the Epiphany the sun came out. 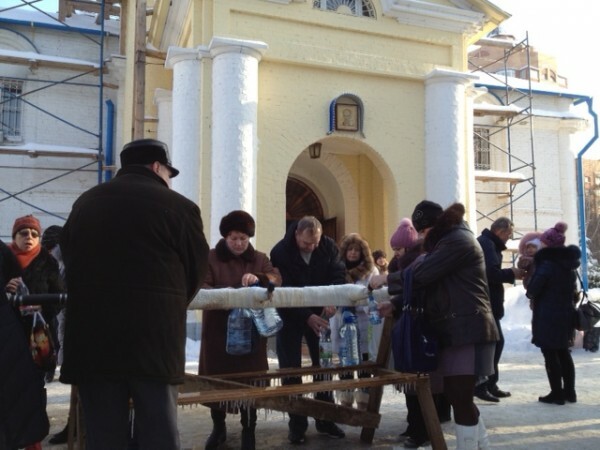 We went to the church, which has been restored recently, to get some water. This entry was tagged russian holidays. Bookmark the permalink.